Robert Moses Grove, known in baseball circles as Lefty Grove, was born in Lonaconing, Allegany County, Maryland in 1900. He went on to win the first Most Valuable Player trophy awarded to an American League player by the Baseball Writers Association of America in 1931 and was elected to the Baseball Hall of Fame in 1947. Since the MVP trophy was the first awarded, the Hall of Fame requested it be included in their museum, but it is reported that Lefty said: “The people of ‘Coney can’t see it if it is in Cooperstown. Beside I promised John Meyers that I’d give it to the school.” John Meyers was the coach at Valley High School, and that is where the trophy remained for a number of years, until there was concern for its safety. With the building of the George’s Creek Regional Library in Lonaconing in 2000, the George’s Creek Promotion Council had found a secure location where the trophy could be preserved, protected and displayed. In the history room in the library, along with other items from the town’s rich past, the Most Valuable Player trophy and other items from Grove’s baseball history are on display. 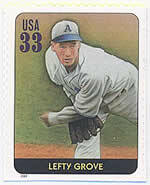 Grove pitched professionally first in 1919 for the Midland, MD team, a local semi-pro league in the Cumberland area. There he was scouted by former Major Leaguer, Bill Louden, a native of Piedmont, WV. Louden was the manager of the Martinsburg club in the Class D, Blue Ridge league. The original tryouts were in Cumberland, and a couple other players were sent to Martinsburg for official tryouts with the club. Louden signed the lanky pitcher from Lonaconing. Grove pitched in seven games for the Martinsburg Mountaineers during the 1920 season, until his contract was sold to the Orioles in early June of that season. Jack Dunn Jr., son of the manager of the Baltimore Orioles, scouted him at a Blue Ridge League game in Hagerstown. According to Suter Kegg, the Sports Editor of the Cumberland Times-News, a storm had leveled the outfield fence in Martinsburg, so Dunn, to get Grove, agreed to pay the price of a new one – which meant Grove went to the Orioles for $3500, or the price of a fence. “I was the only player ever traded for a fence”, Grove is reported as saying. The Baltimore Orioles won a string of seven consecutive International League pennants. In the 4 years he was with them, Grove won 108 games and lost 36. In 1923, pitching 303 innings, he walked 186 men and struck out 330, still the league’s record. In 1925 Connie Mack of the Philadelphia Athletics paid $100,600 for him, topping the flat $100,000 the Yankees had paid the Red Sox for Babe Ruth. For the Philadelphia Athletics, Grove played for seven seasons with 20 or more victories a season, including the record of 31-4 in 1931. In 1929, Connie Mack's team, which many baseball historians will argue was the greatest team in baseball history, defeated the National League Champion Chicago Cubs in five games. In 1930, the A's defeated the National League Champion St. Louis Cardinals in six games. In 1931 the Philadelphia Athletics won the American League Championship, no small feat with Gehrig and Ruth's Yankees in the same league. Grove‘s ERA (earned run averages) was an impressive 2.06; the league ERA was 4.51. In the depression year of 1934, Connie Mack sold Grove to Thomas Yawkey of the Boston Red Sox for $125,000. Relying increasingly on his curveball, Grove spent eight productive years in Boston. Tom Meany, in his book Baseball’s Greatest Pitchers , noted that Grove improved the good curve he already had to the point where it was almost a great curve. In addition, he started to use a "fork ball", a pitch that doesn't rotate much, shudders like a knuckler as it nears the plate and usually lures the batter into swinging too soon. With the Red Sox he won 20 games one season, another season he lead the league in winning percentages, and five times he was selected to the All-Star Game. His fast ball was not as lethal, but he led four times in ERAs. 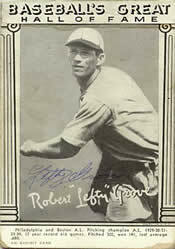 In his last two seasons of note, 1938 and 1939, he went a combined 29-8. 41-year-old Lefty Grove won his 300th game on July 25, 1941 as the Red Sox defeated the Indians 10-6 at Fenway Park and Grove set the mark for highest winning percentage (.680) by any pitcher with that many wins. Robert Moses Grove retired in November 1941 and returned to Lonaconing, where he supported youth baseball and operated a bowling alley. He was inducted into the National Baseball Hall of Fame in 1947, and selected as the greatest left-handed pitcher in 1969, in connection with the Baseball Centennial. He died in Norwalk, Ohio in 1975. His MVP trophy has place of honor in the George’s Creek Regional Library, in Lonaconing, his home town. Thanks to Sandy Grandstaff of the George’s Creek Promotion Council; Debbie Hartman, Robert Hall and John Taube of the Allegany County Public Library system; Elizabeth Levy Malis for permission to use her grandmother Ruth Bear Levy’s paintings; Mary Meyers – Lonaconing historian; Mark Zeigler and the Blue Ridge League; Lisa Dunn and Mark P. Lewyn for the use of the Lonaconing image; Bill Burdick of the Baseball Hall of Fame; the Cumberland Times-News and the Baltimore Sun. Lefty Grove's Home Town, Lonaconing and the George's Creek Library, from Off the Beaten Basepath. Ruth Bear Levy. Recollections of Lefty Grove. Maryland Historical Magazine, 1987 and 1988. Articles by J. Suter Kegg of the Cumberland Times –News and John Steadman of the Baltimore Sun found in Mary Meyer’s Robert Moses Grove scrapbook in the George’s Creek Regional Library.